Contains spoilers for BioShock and BioShock Infinite: Burial at Sea: Episode Two. What makes a bad game ending? If you ask different people they will offer different reasons that reflect upon their own perception of how an ending should work. Should all your choices matter at narratives’ end? Should you feel satisfied at the conclusion of the game’s final boss? Should there have been another twist? There are so many ways that people perceive a game should end and in their own way they are right, but this is kept to themselves and what they desire. With this in mind, there has never been a definitive answer given to the long running debate on the BioShock franchise and the issues that people have found with it: namely BioShock’s ending, and Burial at Sea: Episode Two’s movement from action to stealth, all the while commonly threaded by complaints against their conclusion. Are any of the games’ endings truly satisfying? Are they truly bad? While that is subjective I hope to be able to provide some points that might shed some light on whether the original BioShock has a bad ending. Many remember the wonderful ambiance of BioShock’s Rapture, that immediate awe you felt as you first set eyes on the city submerged below the waves: “A city where the artist shall not fear the censor, where the scientist would not be bound by petty morality…” These opening moments are simply unforgettable, they got us prepared for the adventure that would follow as we dived into a world that saw the rise of brilliance but also its own destruction. Guided by the kind voice of Atlas, this feeling of awe and curiosity carried us through the adventure, as we met with many of Rapture’s now-crazed citizens, forever changed in the pursuit of their craft. The surgeon now wanted to craft the perfect specimen and the artist now wanted to prove his own brilliance, though he was unsettled by those who thought he was crazy. All the while, we sought out the city’s benevolent leader, Andrew Ryan. Then there came the huge twist as the person whom we had grown to trust, Atlas, suddenly revealed his sinister agenda. You were a pawn merely being used so that Frank Fontaine, Atlas’s true identity, could achieve power. We learned that we were controlled by a simple phrase, “would you kindly,” and would do whatever we were told without argument by it. This twist still stands as one of the greatest moments in video game history, and from here the game could only get better, right? Surely a great game deserves a great ending, especially after such a remarkable twist. Would you kindly kill? This became the drive of the game in the last quarter, as no longer was this story just about the broken down society of Rapture and getting to Andrew Ryan, it was about revenge. You would cure yourself of your programmed condition and you were on your way, Frank Fontaine was going down for what he did to you. As you chased him through Rapture you would finally come face to face with him, there was no more running, just the fight to end his life. Except now Fontaine was full of Adam transforming him into some kind of mutant, but you were dedicated to taking him down, and nothing was going to stop you. It is this moment where the most common complaints come to light about BioShock. After the major twist comes, the game begins to lose some of its charm and momentum. Your single focus becomes fixing yourself and then taking down Fontaine. This takes you into some of Rapure’s less interesting locations, and loses the characters which offered their own style to the earlier parts of the adventure. It is easy to see why this section is so well despised, as up until it there was so much to the game, but in this part you are simply after revenge. While these last few sections don’t hold a lot of appeal they do actually speak volumes for the character of Frank Fontaine and help to answer the question of whether BioShock really has a bad ending. It was just you and Fontaine stuck in a game of cat and mouse with you playing the role of the cat while he just ran. While audio logs found in the game suggest his weakness, this is the greatest demonstration as to the type of man Fontaine is, he seeks power and has the resources to achieve his objectives, but nearly every major action is built from the framework of him hiding in the shadows pulling the strings. He got control of Jack by making somebody else do his dirty work, and by extension he removed Andrew Ryan by using his control to allow him to achieve his desires. In truth his power is minimal and he is actually a figurehead who uses others rather than acts himself. Fontaine commands respect with money, false charity and some clever phrases, but he is ultimately very weak and obviously a cowardly man. This is what makes the final boss battle so interesting. 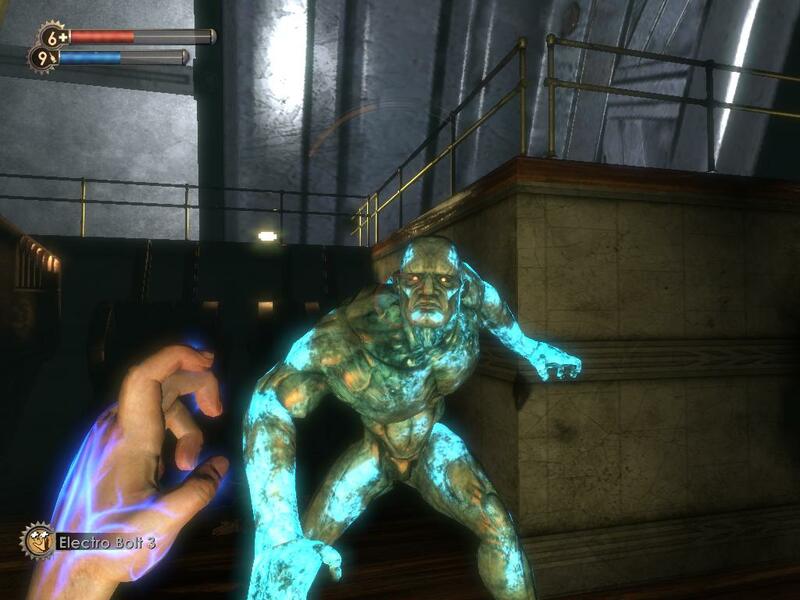 Many claim that this was the worst aspect of BioShock, and in some ways they are right, Fontaine does look silly, the fight is over with little challenge, and knowing Fontaine is truly a coward he isn’t imposing. Even some of the games’ developers, such as Ken Levine, have gone on record to say they are not good at boss battles, and Fontaine’s final fight is evident of that. Yet I have to argue that they are wrong. Yes, the boss battle is pretty weak and many of the claims about it being far too easy are entirely accurate. Yet Ken Levine and his team actually managed to create what can easily be considered one of the best game conclusions ever constructed, and it was purely accidental. The lack of difficulty surrounding the Fontaine fight perfectly imitates a key point I have been trying to address, that Fontaine is weak. Even when he tries to evolve and transforms himself with Adam he is still a weak man. You can give a man power but Fontaine proves that despite his powerful front his own inner weakness is his greatest burden. He goes down easily and closes what seems like a disappointing moment, but this is actually one of the greatest messages on the nature of power and offers a satisfying conclusion to Fontaine as we see him for what he is. By extension the two BioShock endings you may get after the boss are also purely brilliant, one demonstrating the easy sway of power and how you can easily be corrupted by the offer of riches and control. If you chose to be evil you got the ending although it is forced as part of the experience, a point which the developers have agreed with. But this ending is not that bad of course and works in terms of what it is demonstrating, how power can take anyone. Alternately the greatest reward for your efforts, actually being given a chance to have a family and be cared for, carries a great final conclusion. This is undoubtedly one of the strongest moments of BioShock, as it demonstrates the heart and soul of the game, the fruits of your labors as you sought to free all the Little Sisters and you give them a chance, and ushered in your very own reward. Only you can earn your happiness. To a portion of players BioShock has a bad ending, but I personally see it as a brilliant character study and exploration of good and bad. I don’t think anybody is going to change their mind but perhaps they might respect BioShock’s ending more with this interpretation. They might even see BioShock in a different light, and be able to see the game as a greater work of fiction by understanding its shortcomings in a different way. This is still purely subjective and by no means definitive, but in my opinion BioShock’s overall ending is pretty well made, particularly in particularly in terms of its final boss fight and its “good” ending. Additional note: My argument hinges on the suggestion that Fontaine is a weak man which is shown through his boss fight, and his actions. He gains power through others rather than acting himself, although I do have to note that he does act himself in Burial at Sea: Episode Two. He does end Elizabeth himself, but I still argue that he works through others, his act against Elizabeth is more by her own choice and acceptance. He is still weak because he never acts of his own volition. You can read Simon’s last In Defense, on Life is Strange, here.